It is spring time again! Over the winter we’ve collected some wonderful photos that our customers that emailed to us after finishing their projects. We’ve also collected a lot of reviews from customers and continue to maintain a 5 star rating online! The fun stuff! 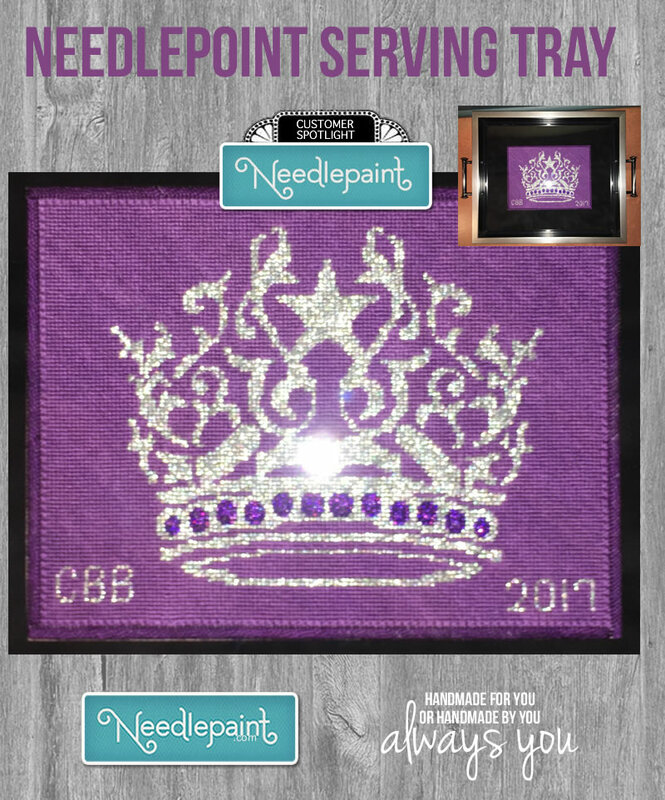 This purple princess crown serving tray was stitched by a wonderful customer in TX. She goes by Weezie, and is one of those people that when you talk to them, you can feel the warmth coming from their hart. She used Kreinik gold #002HL for the crown, and boy does it sparkle! The purple jewels are needlepointed in Kreinik purple. The border is Mosaic and Gobelin. You can see the serving tray in the upper right corner of this image. Next is another fun custom needlepoint project by Weezie, she must have some lucky recipients! 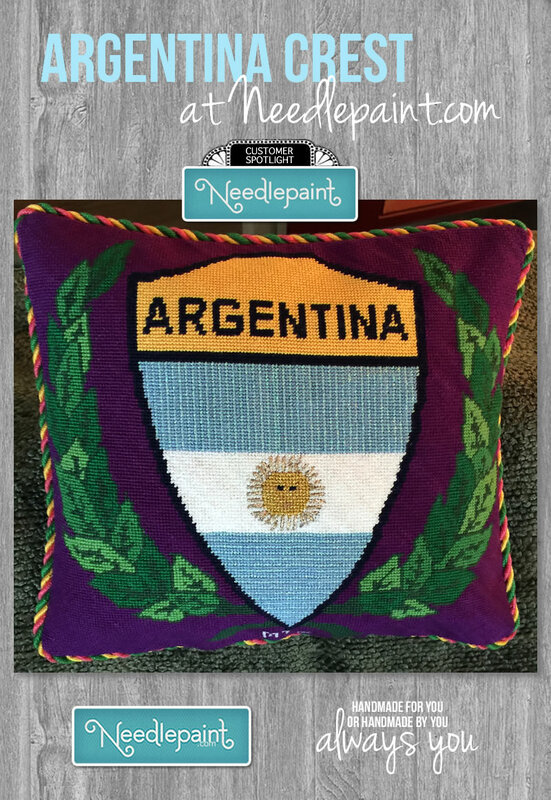 She emailed us a crest of Argentina and we turned it into a custom needlepoint canvas, she took care of the rest! 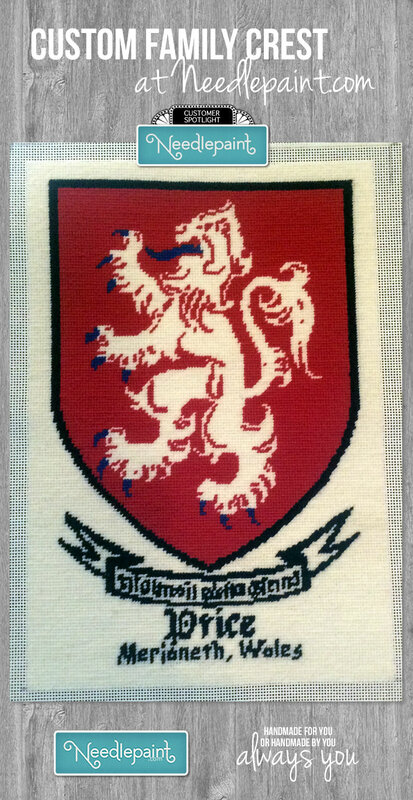 Another family heirloom needlepoint to share with you all is from Mary Ann, in PA. She uploaded her design on NeedlePaint and emailed us the family crest. We helped make sure the canvas had the needed details, including increasing the size of the family name on the bottom, and voila! A piece that will be passed on to the next generation of the Price family. If you’ve been following our blog, you may be able to guess what is coming next. Some more testimonial reviews from customers we’ve worked with recently. Geometric designs occur frequently in Pompeii as well was throughout ancient civilizations. Most often they are used as floors and many are black and white. 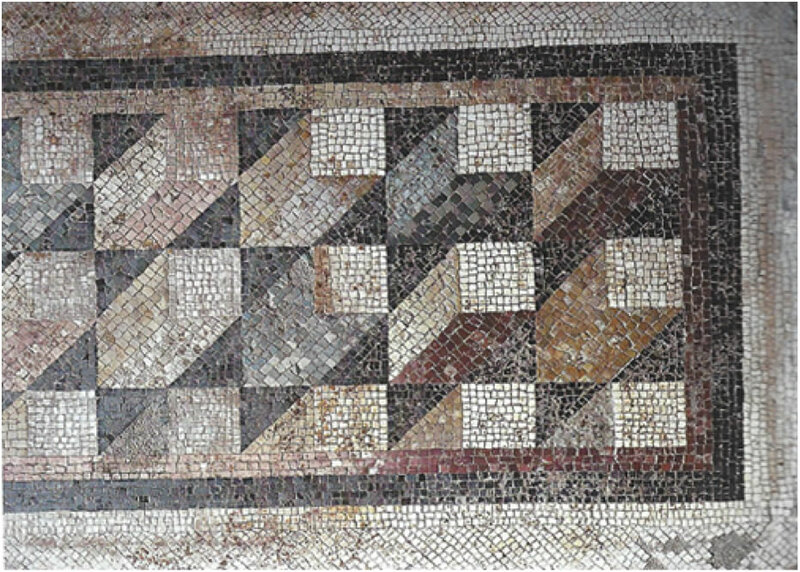 In Pompeii are several polychrome mosaic floor treatments. One was found at the House of Publius Fannius Synistor where it was a threshold in the summer dining area. The mosaic stones were red, green, yellow, and gray on a white and black background. Discovered when the villa was excavated by Vincenzo de Prisco in 1894-5, the mosaic was removed to the excavator’s residence where is resided until acquired by the Archaeological Commission of Pompeii. 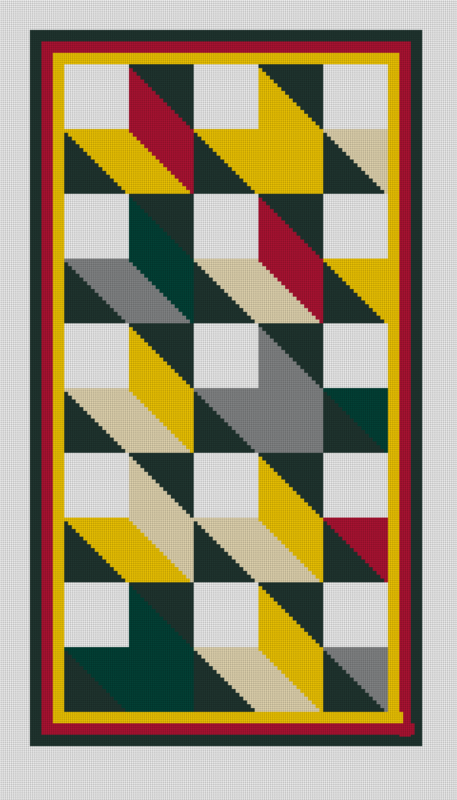 The NeedlePaint recreation of this mosaic is a 22 x 40 inch 10 point canvas to be worked in Waverly wool and suitable for a rug or wall hanging. 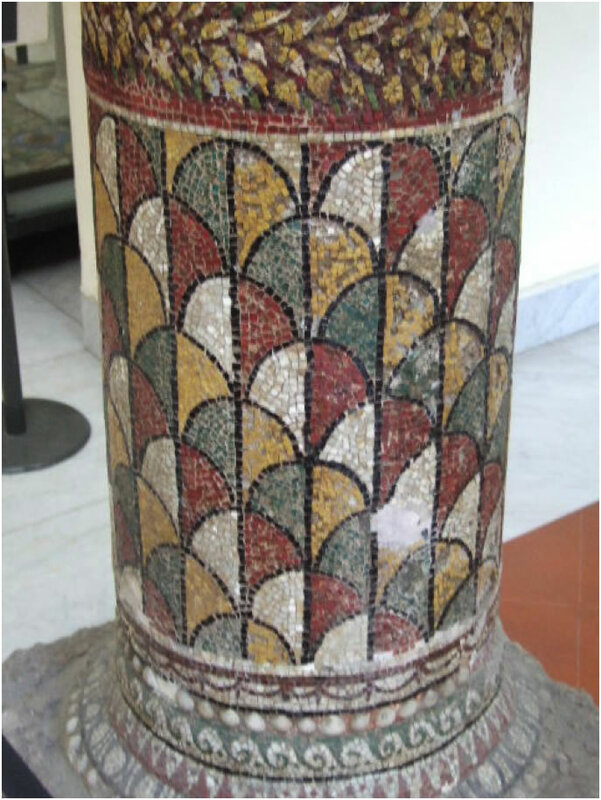 Another distinctive geometric polychrome mosaic treatment is found on the columns in the appropriately name House of the Mosaic Columns. The columns are on display in the National Archeological Museum of Naples. 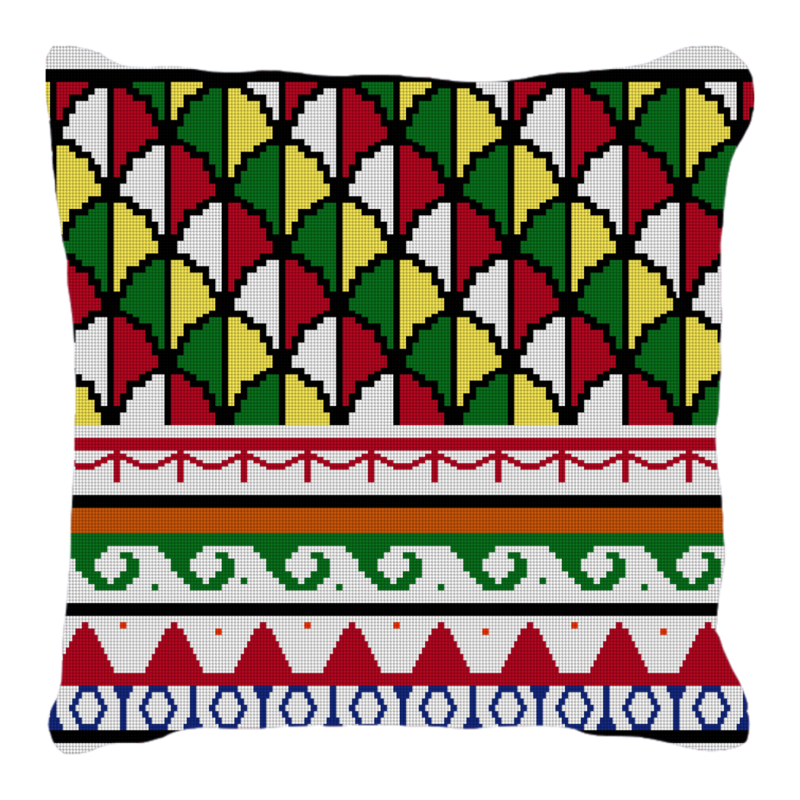 The Needlepaint mosaic design is the section of the base of a column and is a 16 x 16 inch 14-point canvas to be worked in DMC threads or 2 stands of Waverly wool, ideal for a colorful pillow. These canvases are designed to be stitched using the mosaic stitch and thus much quicker to stitch than using the traditional continental for tent stitches.